The Unidrive SP offers flexibility with an extensive range of options that can be combined for space saving solutions. This drive is available in panel mount, free-standing, and modular models. Ranging from 1 to 200 HP, panel mount models are available in 6 frame styles. Free-standing models range from 150 to 1000 HP and are pre-engineered drives, packaged in an IP20 enclosure. Modular systems are pre- packaged solutions for the most common industrial applications ranging from 60 to 2000 HP. The Unidrive SP is dual duty rated and available in all AC voltages. This drive is available without a keypad (NKP) or with an LED, or more advanced, remount-able LCD keypad. The keypad is used to navigate parameter structure but this drive can also be used without one. Other standard features are a SmartCard which enables simple configuration of parameters, Modbus RTU communications, and an internal EMC filter. 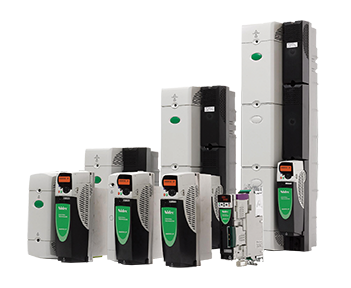 Additional SM Modules add PLC functionality and drive-to-drive networking capabilities. The most popular industrial protocols are available. Customize your drive with additional option modules that easily plug in beneath the cover. Modules are available for specialized I/O, enhanced encoder feedback, resolver, communications, and programming functions. Other optional accessories include HMI units, dynamic braking resistors (internal and external styles available), advanced external EMC filters, and DC back up power supplies. Optimize your motion control with a cost-effective SP Drive system today!